This high-quality steel utility stand is perfect for your laptop/notebook computer, with shelf plates that are designed for light industrial use. The 10" x 12" shelf plate is designed to hold up to 8 pounds, a perfect weight load for a laptop or notebook computer. It is NOT recommended that a "picture tube"-type computer monitor be placed on the stand. 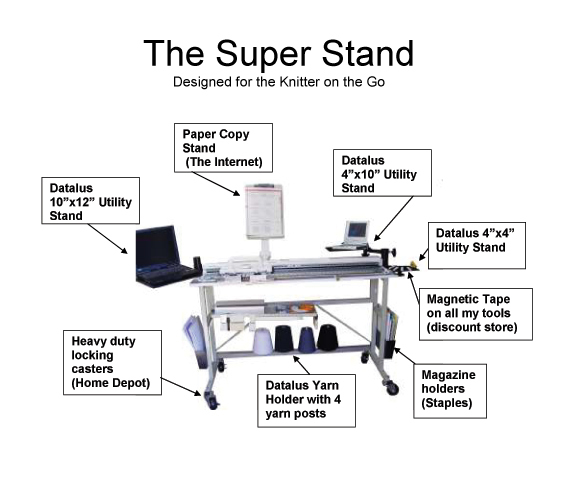 Extra precautions should be taken if you are considering a flat screen monitor and you experience vibration or movement of the table while knitting. In the back at the bottom, and across the width of the stand, is a yarn holder. The shelf that comes with the table is attached forward beneath the bed, rather than in the rear. There are two magnetized metal pocket holders on either side to hold patterns and manuals. In the center back is a holder for reading a pattern or manual. Industrial-weight, locking casters are placed on the bottom for easy movement. Transfer tools are attached to the legs using metal adhesive magnets. 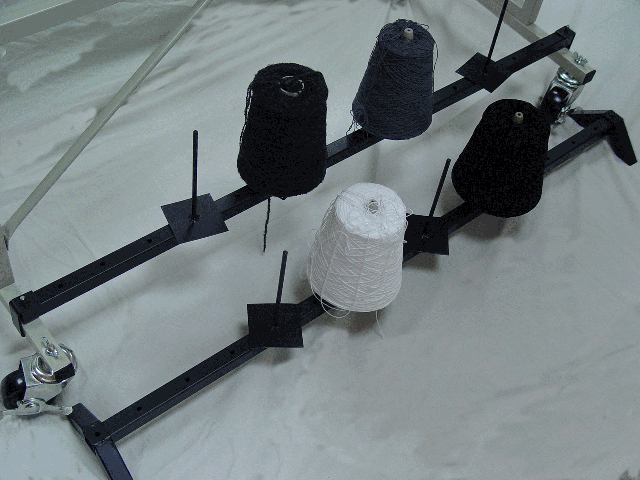 The above picture shows one Yarn Holder attached directly to the stand by two C-brackets and two pins, while the other shows Yarn Holder standing on its own feet. Each Yarn Holder comes with 4 cone holders.